Have you ever received a present that was so fabulous you cried tears of happiness? When Tricky was born a group of friends, led by the fantastic Nicole, got together to get us a voucher for baby photos. But they didn't just get any old photographer. Nicole remembered how much I loved (and ranted and raved about) the woman who captured our wedding day so perfectly two years ago, the divine Jen Regan of Anna Rose Photography. After I stopped shaking, crying happy tears and thanking all the people who had contributed to such an awesome gift, it was time to go to the portrait session - they work best if the bub is under four weeks old so at when Tricky was three weeks and three days old he became a supermodel! The studio was amazing - it was a bright, sun filled room that made me feel warm even on such a freezing cold day. A giant bed with a fluffy white doona was in the centre of the room and on the walls hung gorgeous bunting flags. If I took a photo with a bed and bunting it would be pathetic, but these simple props were all Jen needed to create some of the most beautiful images I've ever seen. The session was so quick - it took just over an hour and some of that time was feeding Tricky to try and get him to go to sleep so we could get some of the gorgeous 'sleeping naked baby' shots - but it didn't feel rushed at all, just calm and relaxed, a testament to how professional Jen is. We had a variety of shots taken, some of the three of us, of just me and Tricky, just Hubby and Tricky and of course, my little Tricky by himself, asleep on the cloud of doona. Jen has a way of not just taking photos, but capturing the mood, the spirit and the essence of the day, so without even seeing the images I knew they would be fantastic. But when I did see them? Wow. Bring on another round of happy tears (yeah I know, all this crying is really getting old). Looking a little bit like a carrot top! I purposely didn't write about the session at the time because I wanted to wait until we had the images hanging up on the walls so I could compare how he looked then to how he looks now, a few short months later. The difference is staggering. He was sooooo little! I cannot believe how fast he has grown. I am so glad we got the photos taken, and we will definitely be having some more taken by Jen as he groes up. And now you too can join in the Jen-worshipping because Anna Rose Photography is sponsoring Where's My Glow's first competition! Hooray! I know I said it would be last month but I had a few other things to deal with - ya know, like having Tricky's skull cracked open and Go-Go-Gadget Springs inserted! But better late than never! I told ya it was gonna be a good one! Could I possibly put any more exclamation marks in this paragraph?! Leave a comment telling me why you'd like to win a studio session at Anna Rose Photography. Don't put it on Facebook, click on where it says "Post a Comment". Make sure you leave the comment as your Google Friend Connect ID so that when you win I'm able to contact you. Spread the word! Help me promote our fabulous sponsor by linking to this competition on Facebook and Twitter - your entry is going to be so great you won't mind others entering too! There are even little buttons just below that will link it for you, how easy is that? Remember to be creative with your answer (I'm a sucker for a limerick or two) and enter as many times as you like - it's a game of skill. Entries will be open for one week only and close at midnight AWST on Wednesday 27th October 2010. GOODLUCK! To see more of Jen's fabulous work, visit her website or blog - If you go back through a few you can even see more of Tricky's shoot and *gulp* I'm in some of them. The winner receives a half hour mini studio session for two children (must be siblings) at the Anna Rose Photography studio in Subiaco, Western Australia, and a 14 day online gallery valued at $275. Prints are not included in this prize, it is the winner's own responsibility to pay for any and all prints they wish to purchase. The entries will be judged by a third part who will be unaware of the entrant's name - basically this means I won't be playing favourites if a friend enters. The winner agrees to have his/her first name published on the blog and is welcome to share their experience at the studio in a guest post. I am a newbie at Aussie Mummy Bloggers too and also a 'Perth-ite'. 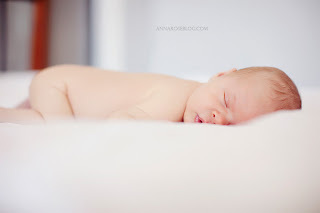 The photos of your little one are so divine! You must be so proud. What a beautiful gift from your friends. One you will treasure forever. I have six children and those early baby days fly by so quickly. My last two children were twin girls and are nearly one now. Too bad I live on the other side of Australia, or I would surely enter! Love love love Anna Rose Photography! as you know I had my wedding photos done with Jen and they turned out beautiful! Ok so I'm not great with the limericks (sorry) so I would just like to mention instead that I would love to win because my darling hubby decided a few months ago that he would organise all our photos. After spending hours renaming and putting them all in organised folders he deleted the copies... at least he thought they were copies but he ended up permanently deleting all our pictures! We took our computer to a repair centre and they were only able to recover about 25% of the photos. Needless to say I was devastated as we didn’t have backups (other than facebook and what was already on our camera). So it would be so so great to get some nice photos done of my boys and I just know that Jen would do a fantastic job! Why would I like to win Anna Rose Photography? Well, who wouldn't? here's a little limerick from a sleep deprived mum and dad of newborn - Nina. She’s needs photography at Anna Rose. I would like to win the Anna Rose photography shoot because the last time I had professional photos done was when my first born was about 6 months old. I now have two children and would really like some of both children, especially the boy as there are no professional ones of him and he's already 2.5. Oh my, those photos are just divine!! After reading the comments the judge (my Dad) has decided that he can't go pass rhyming couplets so Mylo79 is the winner! Congratulations! Your details have been passed on to Jen at Anna Rose Photography and your voucher will be in your inbox soon!